« ATTENTION PR GRADS!!! : Ever thought about branding yourself? 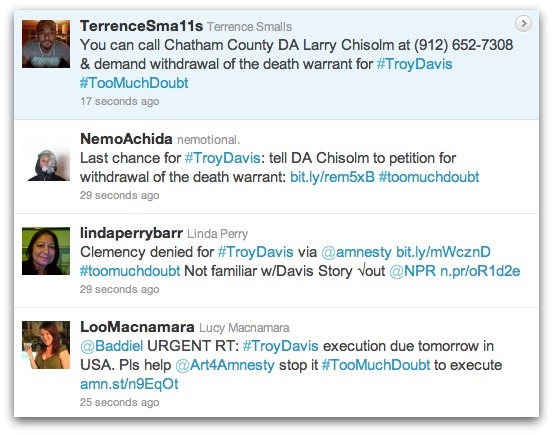 A few days ago, while browsing my timeline on Twitter, I came across a trending topic that read: #TroyDavis… Who’s that? I thought to myself. Fast forward to today, death row inmate Troy Davis has been the biggest story in nationwide news, next to the President’s peace talks with Israel. If you don’t know about his story, like I didn’t before being bombarded by it via Twitter, click here. But as a brief recap, Troy was convicted of murdering an off duty police officer in Savannah, GA in 1989. He was sentenced to be executed based on faulty evidence and eyewitness accounts. Of the 9 eyewitnesses that testified against him over 20 years ago, 7 came forward and said that their statements were not true. One of the other two witnesses, had actually allegedly confessed to others that he was the murderer, while the other said that they were coerced by officers to give the statement. Yet and still, the state of Georgia ruled that he would be executed anyway, by denying all appeals. His execution was set for 7 p.m. tonight, but was delayed literally within 5 minutes of the scheduled time because last-minute appeals and letters sent in from his lawyers. As it now stands (it is now 10:00 pm ET as I write this post) the execution has been delayed as the state of Georgia is awaiting the last word from the U.S. Supreme court on whether they will issue a stay of execution. I write this with the belief that social media has played a major role in spreading the word on a major issue, yet again, to help shape public opinion. I discovered within the past few days of this trending topic via Twitter, that millions who recently became aware of this case via social media, have placed calls and written letters in trying to change the minds of the Attorney General and U.S. Supreme Court. To be honest, had I not visited Twitter, I would not have even known about this case even though I feel strongly about the issue of capital punishment. My excuse is that I barely watch television these days, but you can always find me social networking from my phone throughout the day. This entry was posted on September 22, 2011 at 2:22 am and is filed under Social Media with tags death row, execution, Israel, Kim Kardashian, murder, peace, police officer, President, Social Media, Troy Davis, U.S. Supreme Court, week5o. You can follow any responses to this entry through the RSS 2.0 feed. You can leave a response, or trackback from your own site.